Hearty and healthy, these double nut pancakes are loaded with protein. No more starchy pancakes! Learn more about Freddy Guys Hazelnuts here. For the purposes of this review, I prepared a pancake according to the recipe (it’s really easy, just add an egg and milk), and ate it topped with just butter so that I could experience the pancake before adding additional toppings such as syrup, peanut butter or jam. The pancakes fry up very fluffy and thick, but they are much heartier than a typical pancake because there are bits of chopped hazelnuts in the mix. In addition to providing a heartier texture, they add a very pleasant crunch and a pleasant earthiness and sweetness to the pancake. I also like that the pancake doesn’t taste overly sweet, allowing the natural sweetness of the hazelnut to shine through. One cup of mix makes about 6 pancakes, and they are very substantial and hunger-satisfying, much more so than the typical buttermilk pancake. Very good topped with maple or berry flavored syrup, but I like them best with my chai syrup that I make using brown sugar and a strong infusion of masala chai spices. I love that this is a local product, and I especially love how delicious the pancakes are. You can also make delicious, nutty waffles with this mix. 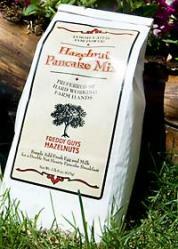 This mix can help you make an ordinary pancake breakfast something special! Learn more about Teatulia Teas here. As you may recall, this is the tea that I received in my Tea Time Treats tasting box … yes, the tasting box from September! I had tried and reviewed this tea before, but, since I am just now finishing up the last of this tea from my September tasting box, I thought I’d explore it a little via review for this blog. I do love Earl Grey, it is one of my favorite flavored black teas. There is just something about the tangy flavor of bergamot when combined with the bold flavor of black tea. An incredible flavor combination. 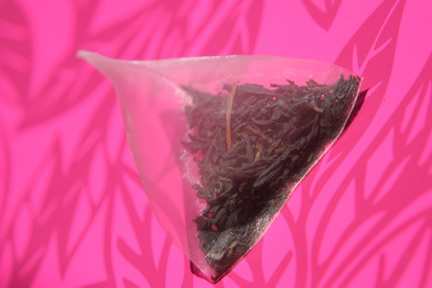 What makes this Earl of Bengal a bit different from a typical Earl Grey is the tea base that is used which is a black tea from a tea estate in Bangladesh. This gives the black tea a different flavor: it is robust and full-flavored, but with a smoothness to it that is moderately astringent. In my first tasting of this tea, I did not note any bitterness to the cup, and while there is not a strong bitter taste with this tasting, I notice just a hint of bitterness – a savory bitterness – that hits about mid-sip. The bitterness leaves almost as quickly as it arrives, offering just a bit of contrast to the sweeter tones of the tea and the tangy notes of the bergamot. I really enjoy this tea. A lovely rendition of Earl Grey! Tonight, my husband made pizza for the family, and when he pulled them from the oven, they ended up looking like “works of art,” so he asked me to write a review about them. 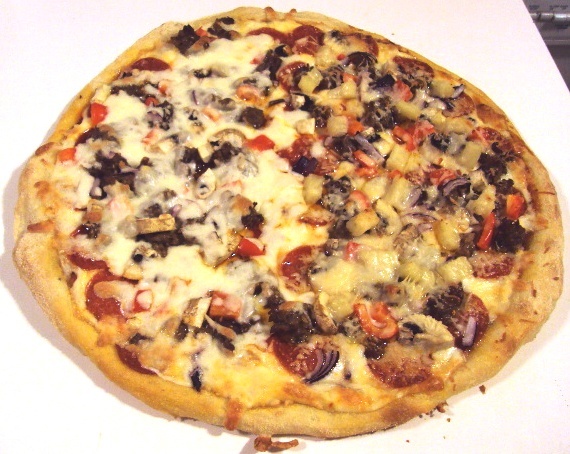 Order: Pizza with pepperoni, Italian sausage, red bell pepper, red onion, mushrooms, pineapple and extra cheese. Recently, my husband offered a helpful hint to our soon-to-be son-in-law. I can’t remember exactly how he put it, but to paraphrase, it went a little something like this: “learn to cook one or two things very well so that you can give your significant other a day off from cooking once in a while.” One of the things that my husband can prepare very well is pizza. The "Works" Douglas Style: Pepperoni, Italian Sausage, Red Bell Pepper, Mushrooms, Red Onions and Extra Cheese. Half with Pineapple. Aside from not having to do much when it comes to cooking dinner (I do have to do some minor preparation, like slicing the mushrooms and bell peppers and cooking the Italian sausage), what I like best about homemade pizza night is that I can have the pizza customized to just the way I like it: pepperoni, sausage, red bell pepper, thick cut mushrooms, red onions, extra cheese and pineapple. Sure, I can get these ingredients at most pizzerias – with the exception of the thick cut mushrooms – but it ends up costing a fortune to get the pizza made just right, and since I’m the only one in this household who likes pineapple on pizza, I feel really bad having to purchase a special pizza just for me. But when my husband makes the pizza, he can add pineapple to my portion of the pizza for just pennies. And my husband really is a master when it comes to making pizza. The crust is crispy and delicious, just the right amount of sauce and lots of cheese … and here’s the best part: the mushrooms! Most pizza joints slice their mushrooms too thin, and they either end up too over cooked and I can’t really taste them because the flavor gets lost with the stronger flavors of sausage and pepperoni. Or worse yet, the texture of the thin-sliced mushroom ends up slimy and that’s just not very good. I like my mushrooms sliced thick, so that I can taste their earthy, meaty flavor and the texture remains intact. I would take Mat’s homemade pizza over anything from a pizzeria any day. 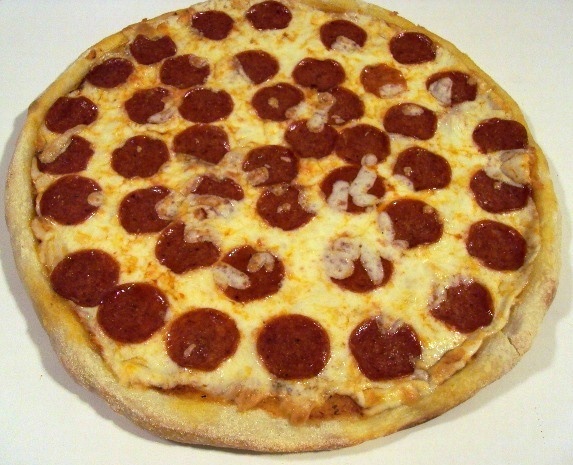 This is the kind of pizza you eat with a fork because the toppings are heavier than the crust. It’s delizioso! This is the recipe that started it all! A delicious, crispy blend of organic oats, sliced almonds and a touch of pure Madagascar vanilla, this is our bestselling granola. Try warming it up as your morning oatmeal or crumbling it as a topping for your favorite peach cobbler recipe. 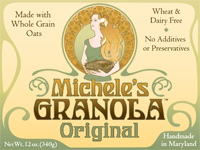 Learn more about Michele’s Granola here. I’m loving this stuff. I occasionally purchase granola cereal at the grocery store, and it’s alright, but, this granola from Michele’s blows the grocery store stuff away! It tastes so fresh and toasty, and it pleasantly crunchy without that hard kind of texture. It has a very delicious nutty flavor. It is sweet, but not sticky sweet as if it’s been saturated with honey. That’s because it hasn’t been. This has brown sugar, but it doesn’t taste sugary sweet. It tastes as if it has been lightly sweetened, just enough to give it a pleasing taste without overwhelming the natural goodness of the other ingredients. And every ingredient is represented in each bite. I taste the almonds and the sunflowers, I taste the coconut. It all works together very well. So delicious right out of the bag, which is how I ate most of my package of this granola. I did manage to save some for a bowl of cereal, and it makes for a very hearty, satisfying breakfast. This is the best granola I’ve ever tasted. So incredibly flavorful. Each individual oat is toasted crisp, and this brings out the deliciously earthy, nutty flavor of it, and really enhances the overall texture, which is light but crunchy. If you try this, you won’t want to go back to ordinary granola. There’s just no comparison. Order: My husband wanted to try the Southside Rib Tips for an appetizer ($11.99) and as an entry, I chose the Baby Back-n-Meat BBQ Combo (Original Style, I chose Texas Beef Brisket to go along with my Baby Back Ribs: $20.99). As I said in the introduction, barbeque is always a hit with my family. It’s probably my youngest daughter’s favorite dinner, and it would probably rank in the top 5 for my husband, and the top 10 for me. Of the few places that we’ve tried in the Portland area, my daughter’s favorite BBQ spot is Famous Dave’s. Before our appetizer was brought to the table, our server brought a small bowl of salted potato chips to the table so that we could test out the rather impressive selection of barbeque sauces on the table: Georgia Mustard (not your average mustard, this one was sweet with just a hint of sharpness from the mustard, and a tangy note from vinegar), Texas Pit (one of my favorites, this one had a nice balance between hot and sweet, with a nice tomato-y flavor), Sweet and Zesty (another favorite of mine, I actually mixed the Texas Pit & the Sweet and Zesty together for my brisket; this sauce had a delicious sweetness to it with a hint of citrus. It goes light on the spice, but there is some spice to it that lingers in the aftertaste), Devil’s Spit (which, as implied by the name is quite spicy) as well as the classic Original Rich and Sassy. Also on our table was Famous Dave’s newest sauce creation called Wilbur’s Revenge, which was (according to our server) is made with habanero peppers. I was not feeling so adventurous as to try this one. Our first visit to Famous Dave’s was shortly after this Portland location opened, and the appetizer we ordered was the Onion Strings. These are yummy. I was a little disappointed that we didn’t order them again this time … disappointed until the platter arrived at the table and I sunk my teeth into one of those amazing rib tips! So good! Succulent, juicy meat that’s been slow cooked so that it falls off the tip of the bone (which is actually more like cartilage than it is bone). A good amount of char on the meat, but, it isn’t overdone. So tender and good. These came with a side of pickles and pickled red onion. The pickled red onion makes a remarkable palate cleanser – not too spicy, not too sour, but just enough of a different flavor to enliven the palate after it becomes inundated with BBQ sauce. But, I still had some room for my dinner. The brisket was amazing – so incredibly tender. It melted in my mouth! I shared some with my husband, and I think he was probably wishing he went with the combo instead of the Big Slab ($22.99) The ribs were also quite tender, with a nice seasoning to them that was not too hot nor too sweet, and I found that these also reheated nicely since most of them ended up in the “doggy bag” for lunch the next day. As side dishes, I chose the Wilbur Beans and the Drunkin’ Apples. The beans were just alright … tasty, but not the best BBQ beans I’ve ever tasted or anything. In fact, I think I’ve tasted better from a can. The sauce could have been thicker, I think they needed to be simmered longer so that the sauce could reduce and thicken. Not bad, but not great either. But, I loved the apples. So much so, that I found myself wishing I had ordered apples as both sides and foregone the Wilbur Beans. These delicious, cooked until tender but not mushy apples were a little sweet warmly spiced from the cinnamon, which was sprinkled liberally over the apples. I could also taste just a hint of almond flavor. 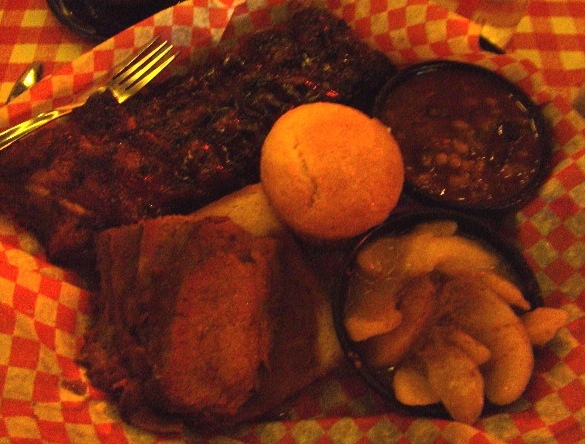 I liked how the sweetness of the apples complemented the the tangy barbeque sauce on the ribs and brisket. I don’t know that I would say that Famous Dave’s is my favorite BBQ establishment in this area, but, I do know that it’s my daughter’s favorite restaurant, so I suspect that they haven’t seen the last of us at Famous Dave’s. The food is delicious, though, and I especially loved the rib tips appetizer – so much so that I think I could have been happy ordering that as my entree. Good food, lively atmosphere, and very friendly service. Not much to complain about! My January Foodzie Tasting Box is here! This afternoon, I arrived home to find my Foodzie Box waiting for me. I had put my subscription on pause for the month of January, so I actually received this Breakfast in Bed box by mistake, but, I am still quite happy with the contents, so I’m not complaining. Despite my previous complaints about the changes made with the Foodzie Tasting Box, one thing this company has got going for them that has kept me with them is an exceptional customer service department. They allowed me to keep the box, which is very cool of them. As I said, the theme of this box is “Breakfast in Bed,” and just as the name implies, it includes all of the ingredients you need for serving an amazing breakfast in bed! 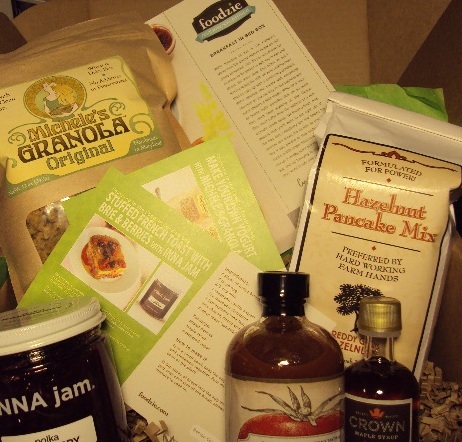 Tucked inside the extra large box were full-sized packages of Hazelnut Pancake Mix from Freddy Guys Filberts, Polka Raspberry Jam from Inna Jam, and Original Granola from Michele’s Granola. There were smaller bottles of Bloody Mary Mix from Fat & Juicy, as well as Medium Amber Syrup from Crown Maple Syrup. We’re fortunate to live in San Francisco, where even the darkest days of winter are still pretty temperate. Still it’s not uncommon for mornings to be socked in with fog or rain and gloom. On those dank days when we don’t feel like facing the chill, we want nothing more than to cozy up with a comforting breakfast. We’re stocking your pantry with everything you need so you can stay in your pajamas and fuzzy slippers a little longer. Whip up a stack of hearty, nutty pancakes that are so good they don’t need anything on top — though they won’t suffer from the addition of a rich, aromatic maple syrup. We found a fresh, crisp granola that you’ll want to eat right out of the bag, and a raspberry jams that beams the summer sun across the months to your table. And if you needed to stay under the covers maybe a little longer than usual, go ahead and mix up a smoky, spicy bloody mary. Or two. If you end up lounging in your peejays all day, your secret is safe with us. Well, living in the Pacific Northwest, I can relate to gloomy, rainy mornings. But, I rarely complain about them, because to tell the truth, I actually love the gray weather. It is one of the things I am fondest of where we live, I love the cool, crisp weather. It makes a good, hot cup of tea all the more comforting. And I’m all about comfort, and it would seem that this box is also about comfort! I’m really excited to try these goodies, with the possible exception of the Bloody Mary Mix. I guess that’s mostly because I am not much of a drinker and have never had a Bloody Mary. But, I’m willing to try it, who knows, I may have found something delicious, and, Bloody Mary mix is essentially tomato juice, right? If all else fails and I’m not in to the Bloody Mary thing, I guess I could add this to my chili, right? I might end up ordering the Jump Start the Year box … because there’s TEA in it! You know, I just may be coming around to embrace the changes made with the Foodzie box! Bacon. Jam. Need we say more? Josh Henderson simmers sweet onions, balsamic vinegar and, you guessed it, bacon, and then purees it down to a chunky, salty-sweet and irresistible condiment. This spread is good on absolutely everything: stuffed in pork chops, baked in tartlettes, mixed in spinach dip… you get the idea. Learn more about Skillet Street Food here. As I mentioned in my article about my Bacon and Bourbon Tasting Box, there were a couple of items in this box that made the decision about which box to choose an easy one. This is one of those products. I’ve had this stuff on my mental wish list for months now (actually, it’s probably closer to a year). So without all the gushing about whether or not it lived up to my expectations (it did), and how much I love this bacon spread (and I do), let me just try to be as objective as I can. It’s not easy, because I do love this stuff and it has definitely lived up to any and all expectations I had of it. Upon opening the jar, I was a little surprised by what I saw. I don’t know exactly what I expected to see, but, this stuff is NOT pretty. In all honesty, it looks … well, it looks a little like something someone might feed to a dog. Not really visually appealing. It looks as though this product had been processed in a food processor, and just by looking at it, you can’t really see any evidence that there is bacon and onions in this, because it looks like a well-processed meat product. Fortunately, it tastes good enough that I can look beyond it’s appearance and appreciate its flavor. It tastes like smoky bacon, and I can also taste the sweetness from the onions as well as the sweet and slightly sour note from the balsamic vinegar. (And really, that is what made me want to try this. Not just the bacon, but that it was a combination of onions, bacon and balsamic vinegar. Three of my favorite ingredients in one container? YUM!) The flavor is rich and sweet and smoky and just flat-out delicious. I have eaten this on several occasions now, having tried it on burgers, on fried eggs, and even stirred into macaroni and cheese. And it is so good. While it’s not much to look at, it tastes remarkably good. 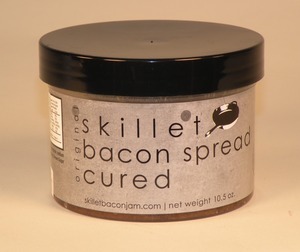 If you’re a bacon lover, you’ve gotta try this stuff! As for a tea pairing: well, I happen to like this with a good roasted Oolong like Zealong Dark from Tula Teas.